In 1984, Tom Reade, along with some supportive friends from his church began what would become the Ark Aid Street Mission (the Ark) by creating a social space for teens to gather in a pinball arcade on Dundas St. Tom had been the leader of a motorcycle gang, ultimately serving time in prison for gang-related activities. Along the way, he had a conversion experience that completely reoriented his life. He determined to do something to prevent other young people from following his previous path of drug use and violence. From the initial arrangement of a safe place to hang out, serving food was soon added to the program. By 1986, a Board of Directors were established and both charitable status and incorporation as a non-profit agency were achieved. Within a couple more years, a small building at 697 Dundas St. was purchased with funds from local people and churches. Daily meals were now served as well as providing extended hours for drop-in. Sadly, Tom died at the age of 40, just as the building was being purchased. Because there was an established Board of Directors, the work continued in spite of Tom's passing. There were many lean years and struggle. In 1990, James Fraser was asked to provide leadership in order to determine if the mission would survive. Over a period of nineteen years, Mr. Fraser considerably enlarged the work, ultimately purchasing the much larger, present building at 696 Dundas St. which again provided opportunity for more programs, more volunteers and service to more clients. Since 2009, Douglas Whitelaw has served as Executive Director. From the beginning, the Ark Aid Street Mission has been supported by the people, churches, businesses and service clubs of London, without government funds. The organization has stayed true to Tom's vision of providing a safe place of holistic care, including spiritual for vulnerable people. The present client base includes all ages, from teens to senior citizens. The basis of the Ark's work is to provide a free evening meal, at least six times per week. In 2013, 25,300 meals were served. In addition, a variety of other services are provided, including, art and crafts, computer instruction, life coaching, advocacy, weekday afternoon snacks and clothing. Due to requests from the clients, in January 2014, a staff person was hired to provide programming to assist people towards more productive and joyful lives. Presently, 3 groups are working through a 12-step 'overcommers' course and several individual clients and families are being assisted in dealing with life issues and addictions. The Ark has a small staff of 3 full-time and 3 part-time employees, depending on volunteers to provide most of the services. The total number of people who volunteer during the course of a year is well in excess of 1000, with about 700 people coming in during a given month. Many of these volunteers come from churches to serve the evening meal, but there are a number of student groups, one or two from businesses and some motivated and motivating individuals who have a lot of friends. The volunteer base is an indication of the support the Ark has from the community, as does the fact that all the food necessary to serve 25,000 meals is donated. The university is the greatest food partner, providing their day old muffins, bagels, sandwiches and donuts and various Starbucks around the city also provide snacks and coffee. The casual observer often comments that the Ark is a community centre. The characterization most often heard from clients is that the Ark is their family and their church. At minimum, it is perceived as a safe place that is trusted to provide a variety of means of help without any agenda other caring for people. On Saturday, June 14, The London Free Press will have an insert profiling the story and present activities of the Ark. This is an opportunity for our suppliers and supporting businesses to help inform the wider community of what the Ark is about. On Saturday, June 21, at Dorchester Community Church, 3912 Catherine St., Dorchester there will be a dinner, silent auction and live music, 'Cruisin' Larry McGill 60s. 70S & 80s. 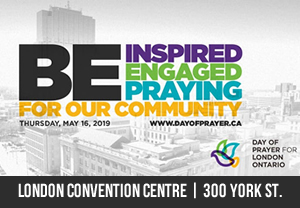 Tickets in the form of 'I Support the Ark' wristbands for the dinner and evening are $30; wristbands for the evening without dinner are $20 and can be purchased from the website, www.arkaidmission.com or by calling the office, 519-667-0322. On Sunday, June 22, 10:00 am there will be a service of thanksgiving at Dorchester Community Church, 3912 Catherine St., Dorchester. Everyone is welcome to attend. More information is available by calling the office, 519-667-0322. As this anniversary honours the achievement of so many volunteers, we trust that many will join in this weekend of celebration. Ways to participate include purchasing tickets for the dinner/silent auction/music evening provide items for the silent auction become a sponsor, assisting with the costs of the celebration purchase advertisement in The London Free Press insert for June 14, 2014.